provide opportunities for association and interchange of thought and experience amongst the members and their colleagues. 1. 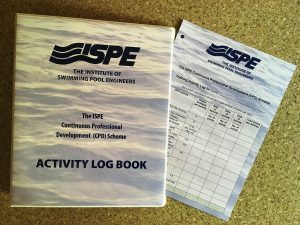 Application for Membership for direct admission based on age and experience within the swimming pool industry for more information please see the Membership page. 2. Student Registration via the ISPE Home Study Course and examination to qualified Technician for more information please see the Student Membership page. Tuesday 28th January to Thursday 30th January. Visit the ISPE stand – A21. ISPE launched its new (FREE) Continuous Professional Development (CPD) Scheme at SPATEX 2017. See the CPD page for more details.